We are implementing in XC some developments to model prestressed concrete slabs. These models consist of three main components: shell elements to describe the behaviour of concrete, truss elements for modelling the prestressing tendons, and bond elements that describe the transfer of stresses between the prestressing tendons and the concrete. 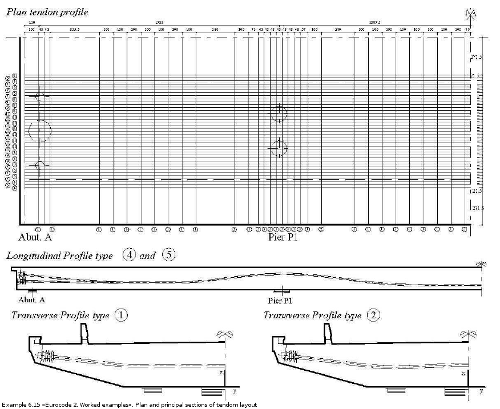 To test the tools, we create a 3D model of a railway bridge deck, taken from the example 6.15 of the publication «Eurocode 2. Worked examples», by the European Concrete Platform ASBL. 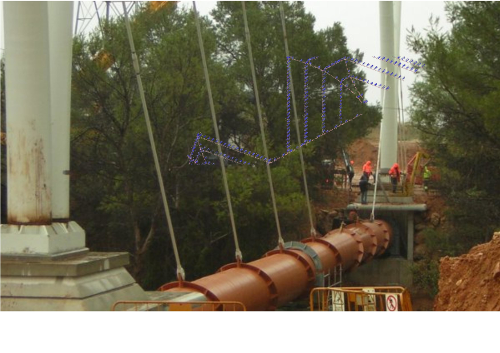 The bridge is made up by a continuous slab on three spans, with two orders of prestressing tendons: 39 tendons in the longitudinal direction and 64 in the transverse one. 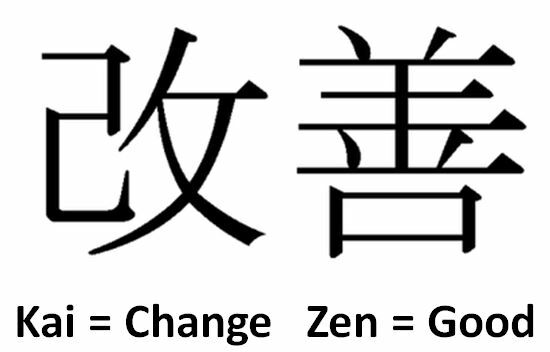 The power of the «openness» allows us (all of us in some degree) to collaborate in the design process. As people of Opening design propose, the possibilities that "new» technologies offer must compel us to rethink the whole design and building processes. Open BIM is, or can be, the tool to use for sharing designs and collaborate on their improvement. Tensegrity structures are usually defined as structural systems that maintain their shape by using a discontinuous set of compressive elements (struts) that are connected to a continuous net of prestressed tensile elements (cables). 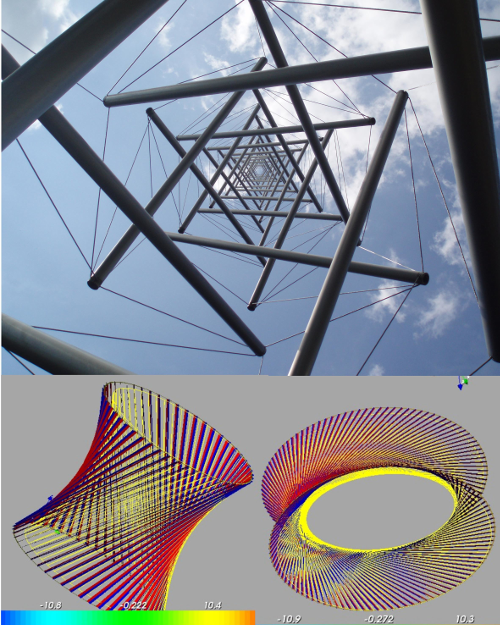 This case study deals with the analysis of several 2D and 3D tensegrity units. In all cases, the results issued by the finite element model in XC compares very well with those forthcoming from symbolic analysis. A 3D-corotational truss formulation with XC appears to be an effective technique for solving the geometrically nonlinear problem that arises in a tensegrity structure. Any motion of a linear system can be resolved into a superposition of modes, combined with appropriate amplitudes and phases. This case study deals with a flexible string fixed at the ends and stretched to an initial strain. The aim is to determine the first three natural frequencies of lateral vibration of the stretched string. The analysis of structural steel joints is a complex problem. The calculation methods proposed in the standards are generally based on simplifications that can make them unsuitable for more complicated geometries (stresses in different planes, arrangement of auxiliary elements such as bushings, stiffeners or plates,. . . ). Nor do the tables and abacuses capture the broad typology that may arise. This paper describes the features of the finite element calculation of two types of beam to column connections and two column base plates. Three-dimensional models have been used which take into account the non-linear behavior of the material and of the contact surface between the bolted parts. 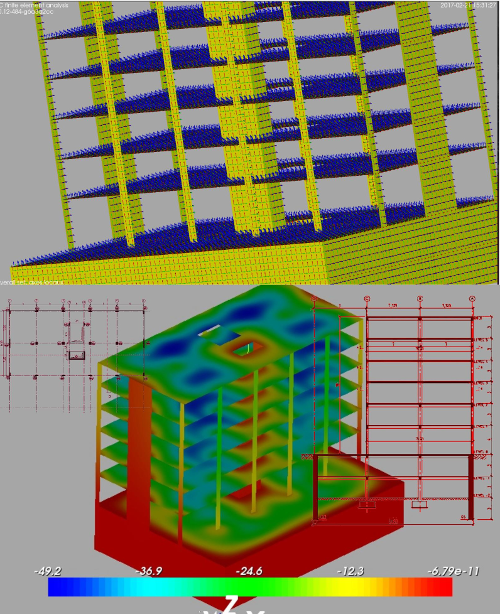 In order to calibrate the calculation, it has been reproduced a finite element model used in the work «Finite element analysis of structural steelwork beam to column bolted connections», by Jim Butterworth. This case study is taken from the European Commission publication «Eurocode 2: background & applications. Design of concrete buildings. Worked examples». It deals with a six-storey building with two underground parking levels. 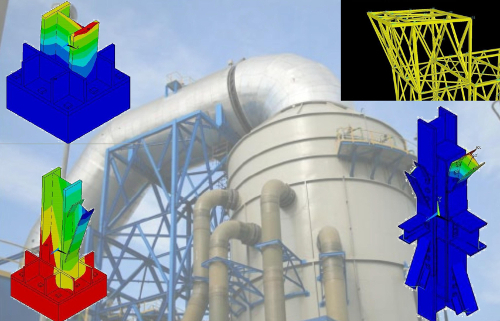 The aim of this exercise is to build the model with XC in order to obtain the displacements and internal forces in the structure caused by a set of load combinations. In upcoming exercises the verifications relating to limit states will be carried out. 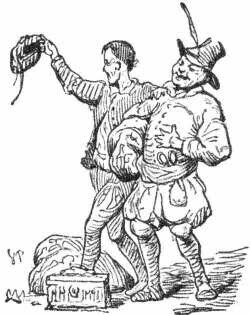 The Emperor's New Clothes is one of my favorite tales. I think that this story illustrates quite well the problem of the «invention of the truth» that affects communities under certain conditions. As engineers, we are quite sure that the methods that we apply to make our designs are based on sound scientific principles, and this is what justifies the existence of our profession. Today, I was reading the article The Role of the Standards in The Invention of the Truth , which call into question the rigor of the principles prescribed by some standards. That makes me think that there is a good reason for us to acquire a solid knowledge in mathematics, physics, etc. and, only after that, use the standard prescriptions while retaining a critical spirit. As Richard P. Feynman explains in its Cargo Cult Science article, it is not always easy to say that the emperor wears no clothes.